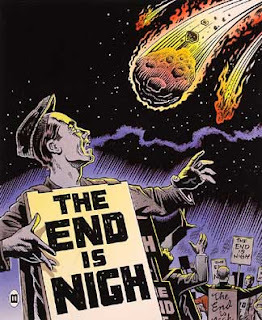 Many of you will have been aware that the world should have ended in a 'Rapture' last saturday 21 May according to Christian fundementalist and self-proclaimed prophet Harold Campher. Somehow we managed to avoid it. I'm sure many of you were as disappointed as I was after having stayed up late to watch it etc only for it to be a bigger non-event than the millenium bug. To other people this will have come as a great relief - except us Liverpool fans who will now have to put up with taunts all next season because we failed to qualify for European competition. Every silver lining has a cloud. 05. Gamma Ray Burst (GRB). A 2004 study suggested that a GRB from a distance of 1 kiloparsec (about 3260 light years which is quite a long way in our perspective - further than Llandudno even, but not that far by universe standards) would destroy about 50% of the world's ozone layer. The report further suggested that historical mass extinctions may have been caused by GRBs. On their webpage regarding GRBs NASA paint a brightly upbeat apocalyptic picture of mass extinctions on land and the near surface of lakes and seas with the accompanying massive disruption of the food chain and total collapse and destruction of anything electrical including apparently even the spark plugs in your car if the engine is on at the time. 04. Earth Crustal Displacement (ECD. A physical pole shift (not to be confused with a magnetic pole shift) ie the actual axis of the earth shifting suddenly. The mechanisms are not fully understood and most theories involve a significant amount of scientific assumption (known as guesswork). It seems highly possible we had one around 12,000 years ago and that they have happened prior to that around every 12,000 years or so, so if there are any legs in the theory we're due one about now. Charles Hapgood provided 'substantial evidence' for a pole (axis) shift having happened back then and Allan & Delair have it in their book . In addition they suggest that all the major civilisations possess stories and legends of huge floods and eartquakes etc and that in actual fact it was the ECD they allege happened 12 millenia ago embedded through fable into the human consciousness. Albert Einstein endorsed Hapgood's ideas so their must be something in it. So what is it and what happens? Basically something - such as a massive asteroid or an unknown planet on a deep eliptical orbit, passes through the solar system without hitting anything but disturbing the 'tilts' (axis) of all the planets. The effects would include massive earthquakes that would devastate entire countries and even geographic regions, assosciated tidal waves, a huge upsurge in volcanic activity (with accompanying nuclear winter) and then secondary effects - an ice age, crop failure etc etc. 03. Magnetic Pole Shift. Magnetic pole reversals happen fairly infrequently - around once every 400,000 years give or take a couple of days. Fair enough - except that the last one was 730,000 years ago so we are well overdue. Scientists are not that sure what actualy causes them and for a long time orthodoxy was that it was movements of the liquid-iron earth's core. Now however it's believed that it's possibly to do with the salinity of the earths oceans. Likewise it was widely held such reversals took thousands of years and did no harm. Recently however it is becoming more believed that they can happen very quickly and be catastrophic. Our planet's magnetic field is rapidly declining (10% in the past 150 years) and magnetic north is shifting ever faster. It is currently predicted to move from Canada to Siberia within 50 years and this level of increasing movement may be indicative of an approaching sudden reversal. During the reversal background radiation levels will rise alarmingly, leading to a higher long term cancer rate and DNA damage to all living things leading to mutated offspring and sterility on a scale that could cause extinction. The multi-pole field will also not allow for magnetic means of navigation, which shouldn't be a too big problem for humans as we have GPS and Tom-Tom and other such vanities (except for the fact it will disrupt all the satellites - so they won't actually work), but it will have a rather big impact on animal life, eg migratory birds will have trouble finding their breeding locations etc. as will whales (which in turn will confuse the Japanese and Norwegians). You'll see polar lights at the equator and the temperature should rise quite a bit. The impact it most definitely will have on the weather is hard to predict other than it's severe unpredictability. Radiowave communication (including TV, mobile phones and satellite up/down) will be severely disrupted and geo-magnetic storms could regularly knock out power grids for considerable periods of time, especially when overhead lines are used. Luckily I'm a whizz at maps and stuff and remember the saying 'mag to grid get rid, grid to mag add' so if I ever felt the urge to start doing night navigation on foot so long as I remember my compass is now back to front, highly erratic and not very accurate I'll be laughing. 02. Coronal Mass Ejection (CME) Apart from sounding like some sort of fetishist practice CMEs happen from time to time on a regular and predictable basis with the last one being the solar storm of September 1859. During that one such things such as the northern lights were visible as far south as the Caribbean but they had an advantage back then - they were not the slaves of technology and electricity that we are now. In North America the telegraph system failed for weeks with the morse 'tappers' bursting into flames, their batteries bursting, and the copper telegraph wires melting across thousands of miles. Should a CME of that magnitude happen today it would cause continental-wide power blackouts which would take months to repair and would also burn-out satellites. NASA started warning back in 2009 that the Sun is becoming far more active and - handily for the Mayans credibility, peak period will commence sometime around the end of 2012 and last around 12 months through 2013. The Sun follows roughly 11 year cycles of activity and every now and then it has a super-cycle. The end of 2012 is the start of a peak of one such super-cycle - how 'super' will not be known until it happens. It is known that solar activity disturbs weather patterns and also affects the earth seismically - for instance Krakatoa erupted near the peak of a solar cycle. We are approaching one now and we have had two Icelandic volcanos and the Japanese quake in the space of a year. Around the last 'super-cycle' peak of 1859 from the period 1857-1861 there was heavy global volcanic activity including several eruptions of Vesuvius in Italy. Will it end the earth? Probably not - not a lot will, but if it is as severe as 1859 (or worse even) then we could be looking at major black-outs lasting weeks or even months in some areas (by 'area' they mean western Europe, north America etc, not the estate down the road), satellite failures, the internet shutting down for weeks at a time and mobile phones not working for weeks at a time. These power black-outs don't just entail the production and transportation means of electricity shutting down - oh dearie me no, nothing as straightforward as that. They actually entail the generators melting, circuitry burning out, overhead cables melting, sub-stations bursting into flames etc. Not that bad until you consider that this will happen across continents and it can't be fixed - it has to be physically replaced. I shall have to renew my library subscription because it sounds like telly is out of the window. 1989 – a 300m asteroid (known as 4581 Asclepius or 1989 FC) missed us by 690,000kms and 7 hours. It was not spotted until after it had flown by. It is due to return in 2012, but is not expected to come as close. 1991 – a 100m asteroid (1991 BA) passed within 170,000kms. In the near future, the number one concern is a 320m asteroid known as 99942 Apophis. Although when first discovered it was considered to have only a 1 in 17 chance of hitting Earth (more likely than 2009 National winner Mon Mome - that was 1 in 100), it is now understood that in 2029 it could come as close as 25,600 kilometres and possiby closer – close enough in fact to knock out a communications satellite so bang goes my Sky subscription. Now when you look at it, all of these have happened before and are due to happen again shortly - or indeed are already overdue. It could be argued that a CME is already in process as we know for a fact that one will commence it's peak period from the end of 2012 and this could be the cause behind the worsening changes in our weather patterns, volcanos and other seismic activity which - as the peak period draws closer and then commences, should all become more pronounced so maybe there is something in the Mayan 2012 malarky after all. Of great worry is that they are all survivable to a degree but bizarrely the less sophisticated you are as a nation, the more likely you are to survive. For instance having no electricity, radar, internet and mobile phones for weeks and possibly months won't bother countries such as Azerbaijan in the main, but would totally destroy the economies of countries in say western Europe and north America leading to starvation and a collapse of society. Can you imagine a strong peak to the CME? One only as strong as the one of 1859? Waking up and finding all the electric off. Radio shut down. No landline phones, no mobile phones, no internet, no factories working, no cash points, no electric trains? Power stations and sub-stations all over the country in flames? Water treatment plants not working, petrol stations closed & planes grounded? Another thing that quickly becomes apparent is that human beings seem to think that the end of the human race is the end of the earth. It isn't. It's just the extinction of a no-longer valid life form that couldn't adapt to changing events. Been plenty of extinctions before and there will be plenty after. What is a virtual definate is that the earth will be drifting around long after the last human has gone 'toes-up'. So there you have it readers. What are your 5 favourite apocalypses? Bird flu? Aliens? Nuclear war? Let us know so we can compare lists and if necessary make the preparations. Labour wins the next election, Blair is brought back in as he's needed to sort out another war, romour has it WMD were found in Carmarthen. Brown find his glass eye and blames Blair for keeping him in the dark, missiles are fired and Wales is wiped out but Plaid retaliates, with remote controlled nuclear pigeons. "a bigger non-event than the millenium bug." Careful, young man. There are a lot of ill-informed folks in the meejah in recent years claiming that the "millenium bug" was nothing but a wind up. This is misleading at best. It may have been overhyped and there may have been some charlatans around, and unfortunately towards the end the lawyers and other penpushers took over the process from the technical people leading to a great deal of wasted money (e.g. unnecessarily replacing old but known good stuff that didn't have vendor Y2K chitties with brand new stuff with Y2K chitties from the vendor lawyers). On the other hand there was genuinely a lot of poor and/or broken software around a few years before 2000. A lot of software would have been OK, but some software would have broken significantly if left untouched, and there would have been significant consequences. But the vast majority of potentially-affected software wasn't left untouched, it was either checked and found OK, or it was fixed, or it was replaced. Things could have been done differently if the lawyers and bean counters and hypesters had kept out of it, but sadly that's not the way we do things in this country yet. It was a let down. We were promised catasptrophe and collapse and sod all happened. It was a complete non-event, and a damp squib. I had a town centre pub in a real rough town back then. That New Years Eve I was prepared for the worst fully expecting my fruit machines to pack in, the direct taxi phone link to fail and other silicon-inspired horrors. Instead all I had was a muindane stabbing and a riot in the streets outside. Imagine my disappointment. Yay! How many blogs cover these things? Well done, Red Flag! Photon over at his neck of the woods has written a brief entry regarding a power cut he experienced the other day. But of most interest is the report in the newspaper that he linked to and the potential for swerious upheaval between 2012-2014 caused by CME. Bit more updating. The authorities are starting to worry and it's starting to get attention. Not least because of how even this very very minor one had some impact. As we know, the last really big one was 1859 and was actually observed by the leading Solar Astronomer of the day - Richard Carrington and I reproduce a part of an article. Beneath it two links to articles. "At 11:18 AM on the cloudless morning of Thursday, September 1, 1859, 33-year-old Richard Carrington—widely acknowledged to be one of England's foremost solar astronomers—was in his well-appointed private observatory. Just as usual on every sunny day, his telescope was projecting an 11-inch-wide image of the sun on a screen, and Carrington skillfully drew the sunspots he saw. "What Carrington saw was a white-light solar flare—a magnetic explosion on the sun""